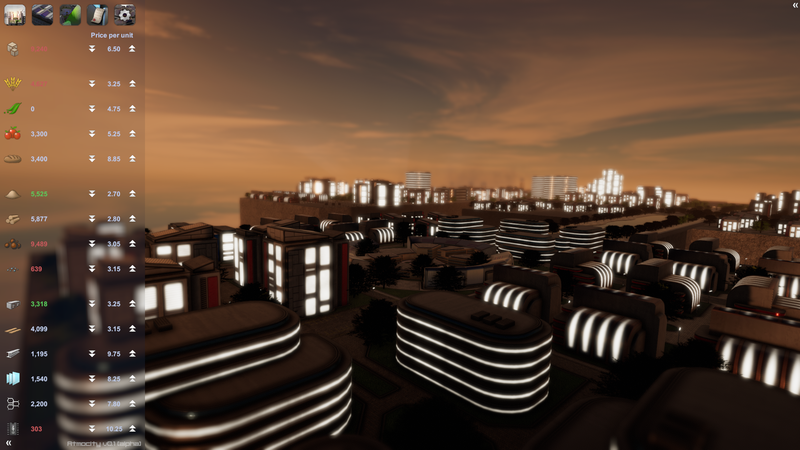 Seeing as I’ve got time of from work, there has been a lot of progress on Atmocity lately. Most of it has been directed towards the upcoming demo and early QA test build, but there’s been a lot of overall progress. I’ve finally gotten around to start working on sounds properly. There is now a selection of ambient sounds coming from buildings when you hover the camera nearby. There will also be an addition of sounds played when buildings are clicked, but this will be added later on. I’ve yet to get work started on music. I’ve only made a few concepts, but nothing that has really hit me as a perfect fit for the game. The work is ongoing though, and I expect to find the right fit soon. 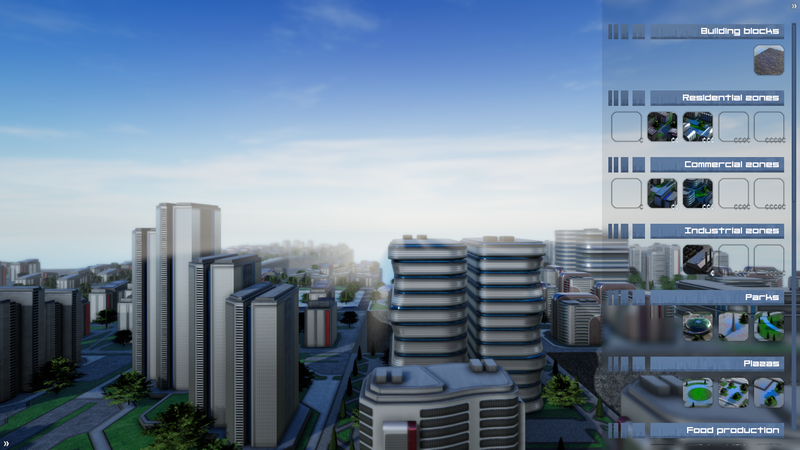 The demo features about half of all the launch day buildings. 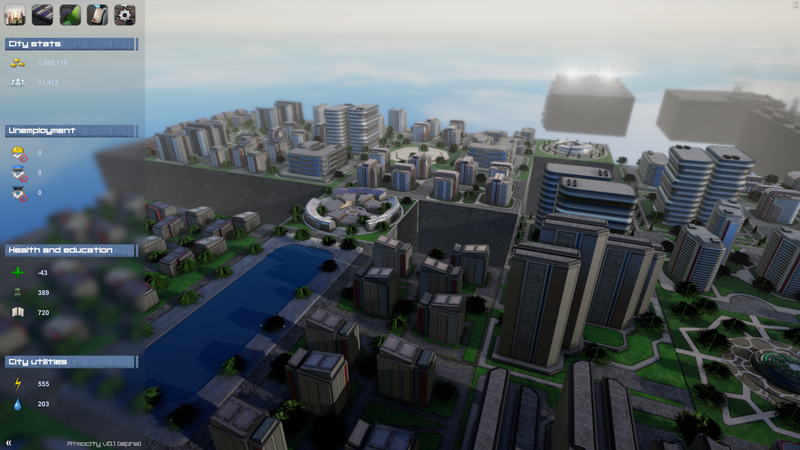 Two residential and commercial tiers, the low industrial tier, all parks, all plazas, most production buildings etc. This means that I’ve been able to put a lot of work into the underlying building code and I now consider it pretty much done. It’s stable and efficient and as far as I’ve been able to tell, bug free. Adding additional buildings will therefore, mostly be a matter of modelling, texturing and rigging them in Unity. That means that building production should pick up pace significantly and I hope to finish this process completely by the end of September. 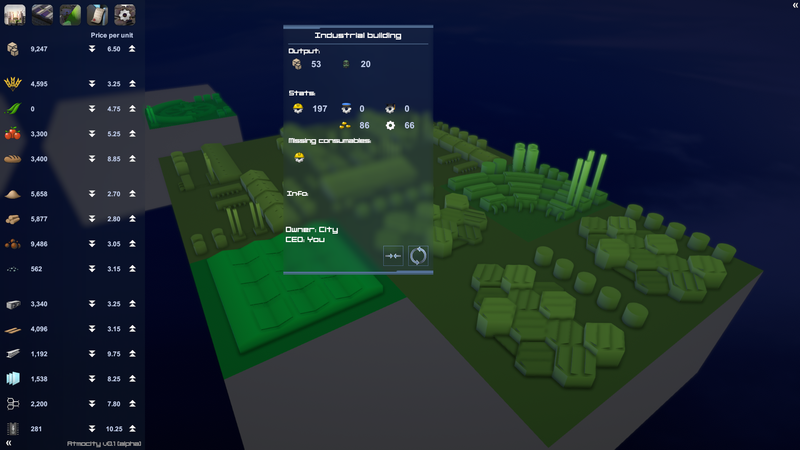 The demo also features a barebones version of the resource trading interface. You will be able to buy and sell resources, and prices will adapt to the under/over supply of resources. What’s missing now is a “price pull” feature that means a lower price on one food resource will also affect the price on the other three. Same goes for building materials. This feature will be implemented later on, as it will also depend a bit on the global economy and how prices of goods are determines in general. As I’ve worked and tested the game more, one thing that has become apparent is the need to quickly review your city to find areas that are not performing well. To make this possible for players, I’ve implemented an efficiency visualization tool. This fetches the efficiency of each building and color codes buildings from red to green. 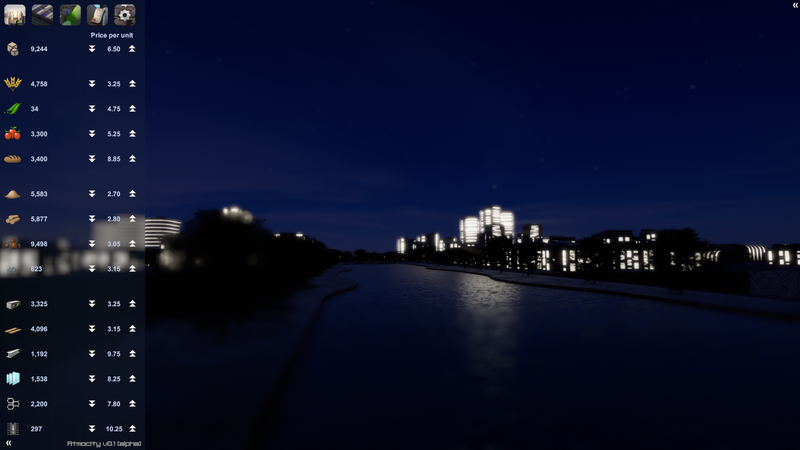 This way poorly functioning neighborhoods will be seen quite easily and the player can start working towards fixing issues. Probably greatest progress visually (aside from there now being more buildings) has been on the user interface side of things. I’ve managed to more or less finalize UI design. A lot of information to the player will be conveyed via icons rather than text. The hope is that icons will be self explanatory enough and that the player will be able to link for example the icon of a missing consumable to the same icon in the building menu to quickly find their way around the interface. There is now also a main menu and a loading screen. Currently it is rather barebones, but it allows for further additions as they are needed. There should be a pretty comprehensive update for the month of august as well! Stay tuned.